Entim Mara is a Kenya luxury camp that offers accommodation in elegantly appointed canvas tented suites that are situated on wooden decks overlooking the Mara River in Kenya. Entim Mara offers an intimate safari experience with just 10 tastefully furnished tents that have an en-suite bathroom with WC and showers. 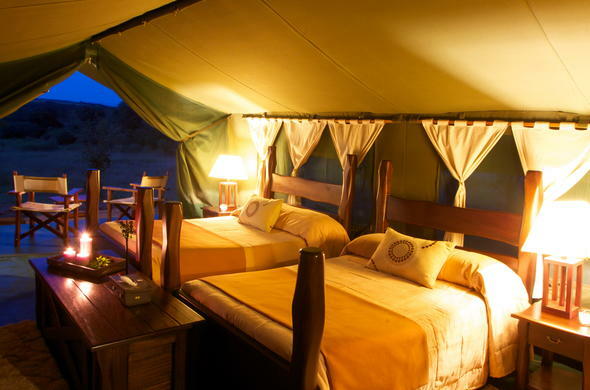 The tents are well spaced out ensuring that each guest can enjoy game viewing from their deck in private. The main lodge at Entim Mara has an open sided lounge area, a great place to relax between game drives and spot animals coming down to the River to slake their thirst. There is a small library with a selection of novels and reference books on African birds, flora and wildlife. The separate bar and dining area offers unhindered views over the plains of the Mara. This Masai Mara lodge offers comfortable accommodation in tented suites that have an en-suite bathroom. The chef whips up delicious meals using fresh ingredients that are regularly flown into the camp.